A guide to New Mexico Amish furniture New Mexico is a long way from the nearest Amish community. But residents of Albuquerque, Las Cruces, Santa Fe, and other New Mexico cities can find Amish furniture within reasonable driving range. Amish chairs, tables, beds, children’s furniture, office furniture, living room pieces, and more can be had without leaving New Mexico via a number of in-state Amish furniture dealers. New Mexico Amish furniture seller featuring Mission, Shaker, Traditional, and Arts & Crafts styles, including Amish rocking chairs, beds, nightstands, chests, mirrors, dressers, jewelry chests, tables, chairs, barstools, hutches, cabinets, computer tables, desks, bookcases, sofas, loveseats, entertainment centers, end tables, more. Solid hardwood construction in cherry, oak, quartersawn oak, brown maple, more. Also sells Amish children’s furniture and items including puzzles, Noah’s Arks, dolls, cradles, children’s tables and chairs, bassinets, hobby horses, etc. New Mexico outlet for the Simply Amish network of Amish-made furniture. To find Amish furniture outside New Mexico, the Amish Furniture Guide main page contains extensive Amish furniture listings for the US and Canada. Note to New Mexico residents: Please be sure to check opening hours of any Amish furniture businesses listed in this guide before traveling long distances. While we strive to keep this directory up-to-date, business locations and schedules can change. Not responsible for changes to information. Are there Amish in New Mexico? The Land of Enchantment has no Amish population today, though they once lived in the state. In the 1920s, a small community of Amish existed in the vicinity of Chico in Colfax County, northern New Mexico. The Amish who settled this area moved from a community in Kansas in 1921. By decade’s end the New Mexico Amish experiment had come to an end, all families having left due to difficult growing conditions (see GAMEO “Colfax County, New Mexico, Old Order Amish Settlement”; The Amish in America: Settlements that Failed 1840-1960 – New Mexico). No Amish have settled in New Mexico since. A number of the New Mexico Amish settlers’ descendants returned to visit the area of the settlement in 2009, including the 96-year-old son of one of the originals. A single farmhouse from the community remains along with a building used for worship (see Mennonite Weekly Review Dec. 14, 2009, “Descendants return to site of failed Amish settlement”). The New Mexico Amish community was an unusual attempt to settle in an area of the country much more arid than Amish are typically accustomed too. Amish live in their greatest numbers in PA and the Midwest, where growing conditions are more suitable to agriculture and dairy farming. Due to its climate and distance from other Amish, New Mexico is unlikely to see much Amish settlement in future. Amish woodcraft has enjoyed a good run over the past few decades. Amish entrepreneurs have entered the furniture-making industry in droves in recent years. Furniture making has proven attractive in comparison to the increasingly high cost of buying a farm. 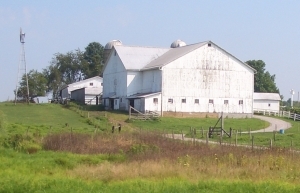 Amish families are often involved as a whole in the furniture business, providing a similar level of involvement as has been often found on the traditional Amish dairy farm. Amish can start woodworking shops at a relatively low initial investment. Some Amish furniture shops are set up in existing buildings on a farm. In other cases Amish build structures specifically for the purpose of furniture-making. Amish furniture shops will typically be located near the home, integrating work and family life. It’s widely-known that Amish restrict the use of public grid electricity. Depending on the community, Amish power their equipment in different ways. The most conservative Amish furniture shops are operated through a diesel engine which powers a drive shaft attached to pulleys, which in turn power a variety of machines in the shop (saws, planers, sanders). More progressive Amish may use shop equipment adapted to be powered by air or hydraulic means. Through creative engineering, Amish are able to remain off-grid yet still generate sufficient power to efficiently produce furniture. Amish furniture has enjoyed a very positive reputation. This renown has been driven by a few factors. First of all, Amish furniture has a reputation for high quality. Amish society emphasizes work well done. Amish feel the Christian obligation to “do unto others…”, an aspect that shines through in their business lives. Amish work is typically well-done, and though Amish are admonished not to indulge in pride, Amish furniture craftsmen and other entrepreneurs can take satisfaction in quality work done for their customers. No group of people is ever perfect, but the Amish Christian background also helps Amish businesses by generating a sense of trust among buyers of Amish furniture. Another boon for the Amish furniture reputation is the use of high-quality materials, including solid hardwoods. Amish furniture is often promoted as not using particle board, veneer, or pressed wood in its construction. Amish wood craftsmen typically make use of solid hard woods such as cherry, maple, walnut, black walnut, oak, hickory, quarter-sawn oak, and more. Amish do create furniture using soft woods such as pine and cedar as well. Rustic Amish furniture is another popular category, with hickory furniture prominent in the Amish repertoire. Finally, Amish reach a wide scope of the furniture market thanks to their versatility. Amish create furniture in a range of styles. Popular among them are Shaker, Queen Anne, Colonial, Mission, Arts and Crafts, Prairie, Craftsman, and contemporary styles. Amish woodworkers also frequently do custom furniture construction to the specifications of the client. If you’d like to buy Amish furniture in New Mexico, there are a few options. There are at least a pair of New Mexico Amish furniture dealers, at which you can visit and peruse a wide range of Amish-made home furnishings. More adventurous buyers (and with some time on their hands) might choose to visit an Amish community outside New Mexico. However, with most major Amish settlements hundreds of miles away, this requires a greater time and money investment (see the Amish State Guide in the main menu for info on Amish settlement locations). Finally, New Mexicans can order Amish furniture over the internet from a number of online Amish furniture providers. Online Amish furniture businesses often provide shipping, in some cases free of charge, to the continental US, including New Mexico. I have some antique chairs that are Amish made and would like to sell them. Who would you recommend I contact? Amish wholesale furniture in Western U.S.
You’re unlikely to find Amish wholesale sellers in New Mexico as no Amish live in the state. Colorado however has a number of small Amish communities.